A new film by Anchovy Pictures. Set in the Paris graveyard, this is a wonderfully bizarre comedy following theself-discovery of two lovers in a Parisian necropolis. First Prize Winner of Rhode Island International Film Festival for best short film. 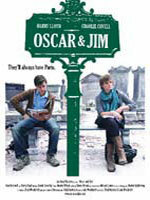 Oscar and Jim began its life as a play, presented at the High Tide Festival and subsequently read at the Soho Theatre. Reviewers loved it, ‘hilarious’ and ‘deliciously bizarre’ and it took on a new life as a movie. It went on to win the First Prize of the Rhode Island International Film Festival for Best Short Film.